One crucial step in helping your adolescent child build a superior mind is to protect the prefrontal cortex (PFC) from damage during adolescence – the developmental period for wiring the foundation for critical thinking. To this end, I’ve written a number of posts about the dangers of teen substance abuse. You need to add one more danger to the list: the potential for excessive screen time to derail normal development of the PFC. 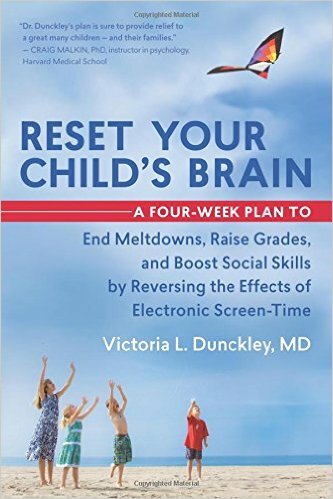 In her new book, Reset Your Child’s Brain (2015), Dr. Victoria Dunckley describes in detail how teen use of cell phones, TV, computers, laptops, tablets, and video game consoles can create symptoms that look like ADD, ADHD, and autism, while physically disrupting the normal development of your child’s brain. Education expert Jane Healy sounded the alarm years ago about the negative effects of screen time in Endangered Minds (1990) and Failure to Connect (1999), but even though her books have been best-sellers, the situation in the youth culture has gotten much worse in recent years. Motivated by the belief that computers will enhance learning, school systems everywhere are spending billions of dollars to introduce technology to the classroom, even though the research shows the most of these initiatives have little or no positive effect on learning. Television screen technology and programming have advanced. Nearly every home in the U.S. has a wide thin-screen television, and more innovations are on the way. A new, more advanced version of cell phones appears on the market every year or so, and young people want them to “stay connected.” One survey reported that the average teenager sends 100 text messages a day. Video games are now a more lucrative business than motion pictures. The holy grail for game producers is virtual reality, a screen experience so real that it doesn’t seem like a simulation, and they are getting ever closer to their goal. Violent video games are most popular with teen boys, and they play the games with their friends via the Internet, often through the night. According to Dr. Dunckley, both the acute experience of a violent video game and the chronic use of cell phones can create serious behavioral problems and alter the wiring of a child’s brain so that they crave the same stimulation and excitement in the real world. The excitement generated by screen content – even the connectedness provided by cell phones, produces adrenaline and cortisol, followed by dopamine (the pleasure neurotransmitter) when they achieve their virtual goal. Kids often become addicted to the experience. Some of the negative consequences: poor academic performance, emotional meltdowns, minimal social skills, weight problems, inadequate sleep, and worst of all: instead of wiring the PFC the kids are wiring their emotional reaction centers for fight-or-flight. In other words, young people are creating the equivalent of brain damage in their PFC, the center for “executive thinking,” critical thinking, concentration, impulse control and judgment. In short, screen time may be as dangerous as substance abuse for derailing normal development of the PFC – with lifelong consequences. The sweeping 21st-century technology innovations are driven by profit, of course, creating shocking problems that parents of an earlier generation didn’t have to deal with. And even though experts like Dunckley are reporting the problem, the trend toward more screen is accelerating. Dr. Dunckley has treated hundreds of young people successfully, and her book explains her method, which is essentially three weeks of “cold turkey.” Even though it works, the author acknowledges that this approach is about as challenging as it gets, and she gives plenty of advice and tips for doing it right. If you are the parent of an adolescent child, you are taking a horrible risk by not reading this book. Dr. Dunckley’s insights are presented in several areas of my new book: How Your Teen Can Grow a Smarter Brain.